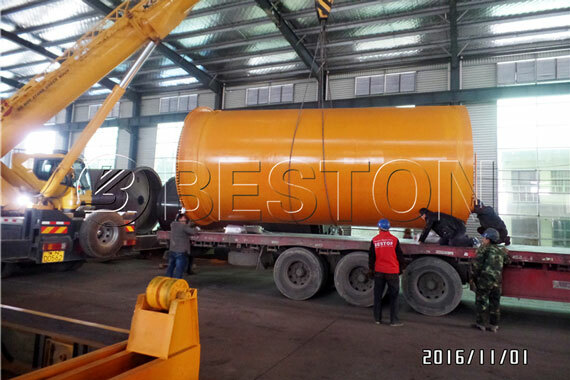 As a leading manufacturer in the field of waste tyre pyrolysis in China, Our newly designed waste tyre pyrolysis plant for sale has the features of environmental protection and energy-saving, high oil output rate, safe, durable, etc. 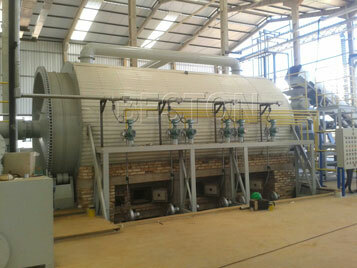 The latest tyre pyrolysis plant for sale refers to heating the waste tire materials in the reactor through high temperature, and when it reaches the related temperature, the oil gas will generate in reactor; the oil gas will be condensed into fuel oil passing through the subsequent connected condenser system; the fuel oil can be used as fuel directly. After the oil fully discharges, the left slag in reactor is called carbon black, which has high combustion value and also called biomass. This kind of carbon black can be compressed into ball to replace the coal directly or ground into fine powder as additive. Besides, the steel wire can be recycled by steel and iron industries. 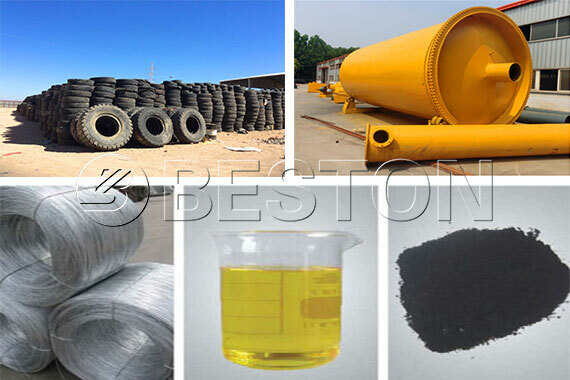 Generally, we can get 45% tyre pyrolysis oil, 35% carbon black, 12% steel wire and 8% combustible gas from the whole tire pyrolysis process. All the end-products are in high demand and have wide applications, good prices in the market, which will surely bring great benefits for you. In order to guarantee the raw material can be fed continuously in a sealed and uniform feeding system, the pyrolysis of tyres must have a shredder pretreatment. The size required blow 3-5 cm is better. The pyrolysis tire recycling system has introduced the sealed screw conveyor to feed, and the machine can set the feeding speed to control the whole process in order. The tyre pyrolysis equipment has also installed the airlock which can make sure that there is no air entering into reactor and prevent the hidden danger. Pyrolysis of waste tires adopts the indirect heating system, and the fire will not get in touch with the inline of reactor. The heating source connects with the pyrolysis system through the burner and heats in hot air, which can extend the using time of reactor and heat uniformly. Cooling system is also an important part of tire pyrolysis system , which can fully cool the oil gas and increase the oil yield. Beston waste tyre pyrolysis plants use the screw conveyor to connect the most terminal of the reactor to flush off. Besides, the outside of the screw conveyor has recycling cooling layer which can prevent the effluent carbon black from overheating to destroy the removal equipment and scalding workers. 1. 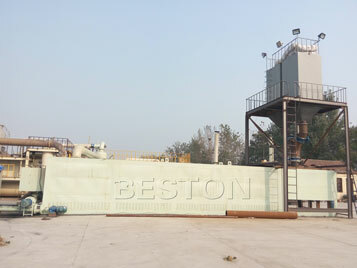 Tyre pyrolysis plant manufactured by Beston Group has introduced the international top technology called “The Zero Stripping”, which doesn’t need to use special technology to make the steel wire and rubber for secondary separation in the process of pyrolysis. This kind of technology plays an important role in saving energy and reducing cost. Besides, it also greatly upgrades the economical efficiency. 2. In order to ensure the gas doesn’t overflow and increase the pyrolysis efficiency in the production process, the tire pyrolysis plant has introduced the micro negative-pressure technology, so that it can thoroughly eliminate the insecure hidden trouble because of the gas overfilling. 3. After the tires has finished the pyrolysis process, most parts become liquid products and a little combustible gas can be recycled as the fuel in the pyrolysis reactor, which ensures the heating supply of the pyrolysis reactor and reduces the waste gas discharging. 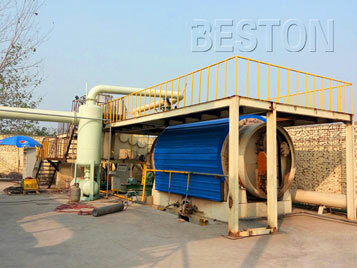 In this way, it is conductive to improve the efficiency of economic and environment. 4. 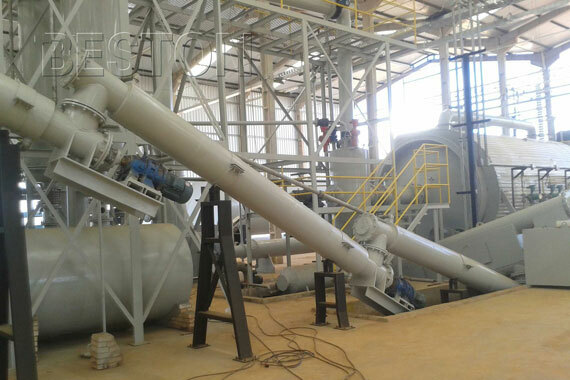 The waste tires pyrolysis plant design can meet the international standard, which has the compact structure, scientific and high-efficiency production line, safe and table operation, and the powerful processing ability. In addition, the collocation of each system is reasonable. All of these unique features have positive meaning on promoting working efficiency, reducing energy and protecting ecological environment.